Meet Directors reserve the right to limit entries in events 7 & 8 (1650 yd Freestyle) should demand for these events exceed pool rental time. Entries will be processed in the order in which they are received. Minimum provable time to enter the 1650 yard freestyle is 25:00.00. Athletes wishing to enter the 1650 Freestyle who do not have a provable 1650Y/1000M free time under 25:00.00, must have a provable 800M/1000Y time of 15:00.00 or faster. These athletes will be entered into the 1650Y freestyle with their 800M/1000Y time and will be seeded after all 1650Y/1000M times have been seeded. Please mark swimmers entering with 800M/1000Y times as "exhibition". All swimmers will be eligible for awards. 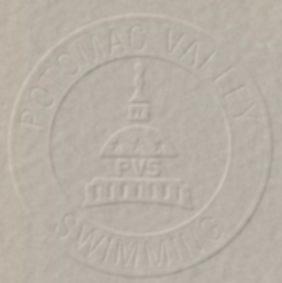 Coaches who have swimmers who they believe can complete the events 7 & 8 (1650 yd Freestyle) faster than 25:00.00, but who have not satisfy the entry rule, may petition the PVS Distance Coordinator, Bill Marlin, for an exception. The petition should provide specific evidence why they believe the swimmer can complete the event within 15:00.00. All petitions must be submitted prior to the entry deadline. Events 5-6, 9-12 year old 500 Freestyle, will be swum fast to slow alternating women and men. It will then be followed by Events 7-8, 13&over 1650 Freestyle, which will also be swum fast to slow alternating women and men. Officials: Each participating club is requested to provide at least one table worker or official (referee, starter or stroke and turn judge) per session if entering 25 or more splashes. Certified officials wishing to volunteer to work this meet should contact the appropriate club officials chairman shown above prior to October 30. Please include your club affiliation, certifications held and sessions you wish to work. Officials volunteering should sign in at the recording table prior to the start of Warm-ups. Certified officials who have not previously advised of their availability may volunteer their services to the Referee at this time. Entries should be submitted using Hy-Tek Team Manager via e-mail. Events for this meet can be downloaded at 14mm110907 . Include in the e-mail subject heading "2007 PVS November Open - ****" with the club's initials substituted in place of the asterisks. Also include training site if your club submits multiple entries and number of timers being committed. NOTE: Assignments of clubs to pool sites will be reviewed after entries are received. If necessary to achieve reasonable balance, clubs may be reassigned. Entries, once submitted, are not refundable. Swimmers must provide own timer for Friday night session for 500 and 1650 Free.